After getting home at 4:00 AM and sleeping until 9:00 AM I was ready to tackle my day! It's an odd feeling because most of what we need to do is done. We're not 100% ready. We probably won't be 100% ready even when the boys turn twenty-five and finally move out of here. But even though we are are not 100% ready we are in a state where if Jen goes into labor tomorrow we will be able to return our newborn children to a place that is mostly ready for them. 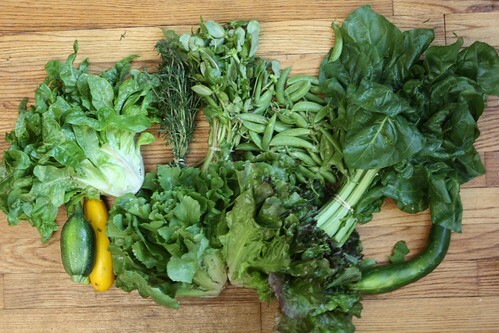 This week we got a pound of summer squash, a head of red leaf lettuce, a head of green leaf lettuce, a head of escarole, a pound of sugar snap peas, a bunch of purslane, a bunch of summer spinach, a bunch of summer savory, and a Hoop House cucumber. Apparently there was some bad weather at the farm which stunted the progress of the zucchini so we got a smaller portion this week. I found this to be something of a relief as the volume of squash often times stresses me out. Before dinner I actually had a little downtime. Jen was flying a kite and I had about an hour with absolutely nothing to do. Dishes were done. Baby furniture built. I hesitate to say it, but I was almost a little bored. This may be the last little bit of downtime I get for the next ten years so I thoroughly enjoyed it. Some time I may look back on this and be envious of my past self for having this luxury. After that small bout with boredom it was time to get to work! With the lettuce coming at us fast and furious I had to get to work and do something with it. I started us off by making a big Caesar salad. 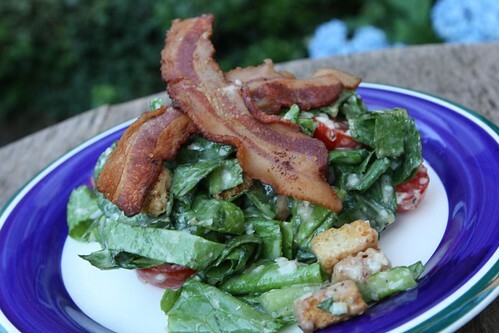 Even with Jen's pregnant dislike of salad greens I thought she would be happy about this as she does, on occasion, love to have a nice Caesar salad. I am lame and did not make my own dressing but I garnished it with some crispy fried slices of slab bacon, anchovies, tomato, and croutons. It's not very creative to just take our farm vegetables, cook them up, and position them around some grilled meats. However, that is essentially what I am doing here. 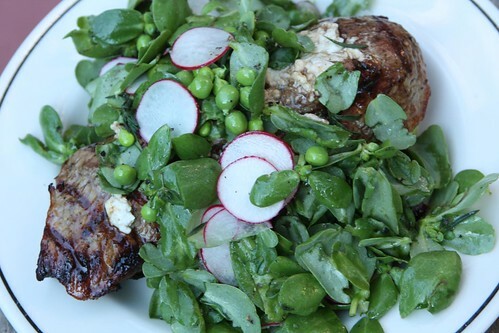 I tossed the purslane with some sliced radish, sugar snap peas from their pods, some lemon, olive oil, salt, and pepper, and served it up with a grilled sirloin steak which I'd marinated in Greek dressing for about six hours. What we got was an incredibly small amount of purslane. It sort of tasted like a cross between fresh peas and grass clipping. Jen actually liked it a bit more than I did. It wasn't bad, it just didn't grab me. I always feel like I'm somehow cheating when I marinate something in salad dressing. Jen turned me on to this a few years back when she requested something done this way for dinner. The things is, it's pretty tasty. 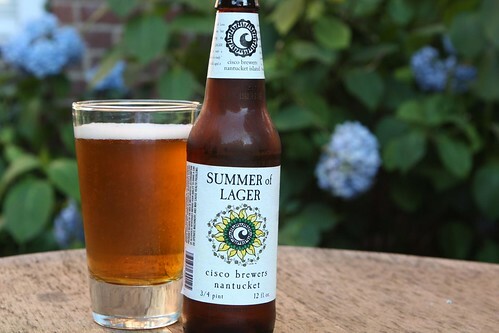 For a drink I cracked open this Summer of Lager from Cisco Brewers in Nantucket, MA. Readers of the blog know that I'm not the world's largest lager fan, but this was quite refreshing on a warm summer evening. The label makes the claim that the word lager means "to wait a wicked long time until it's ready." I guess I need to brush up on my German. This beer was brewed in the fall, aged in the winter, then sampled in the spring, and finally released in the summer. Don't get me wrong, this was a very good lager. However, it's always astounded me that it takes months and months to make a crummy lager when you can make a really nice ale in just about a month. Update: after today's Tour de France stage the results are in from our fantasy league. I'm like the tortoise. It's a three week race, people! Labels: beer, Grilling, How'd we use it?, salad, Sports, What'd we get?